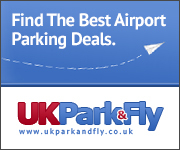 Want to recommend UK Park and Fly’s airport parking deals website to your own website visitors? Now you can, with our pre-made banner links. Available in a range of size configurations to suit most sites. If you can’t find a banner to suit your site then contact us and we’ll be happy to help arrange an alternative banner size. Unsure how to add this to your website code? Click here to be taken to our simple install instructions. Pick the banner that best fits the space on your site and click on the text; this will highlight the code you need to put on your webpage. Right click over the box and copy, or press ctrl + c to copy the code to your clipboard. Open the webpage where you would like to add this code (inside something like Dreamweaver, notepad or other software that you use to edit your site). You may even be able to add this to a content area in your CMS! Navigate to where you would like the banner to appear, right click and paste or ctrl + v to paste the code into the html or CMS box. Save your html or CMS page and open the page you added the banner to in your web browser to make sure it’s in the correct location. Change the position of the code until you’re happy with the position on the page and voila, our banner has been added. Thank you for sharing UK Park & Fly on your website.